For other people with the same name, see William Bailey. Mark Robert Bailey (born 13 January 1965), known by his stage name Bill Bailey, is an English comedian, musician, singer, actor, TV and radio presenter and author. Bailey is well known for his role in Black Books and for his appearances on Never Mind the Buzzcocks, Have I Got News for You and QI, as well as his extensive stand-up work. Bailey was listed by The Observer as one of the 50 funniest acts in British comedy in 2003. In 2007, and again in 2010, he was voted the seventh greatest stand-up comic on Channel 4's 100 Greatest Stand-Ups. Bailey was born in Bath, Somerset, and spent most of his childhood in Keynsham, a town situated between Bath and Bristol in the West of England. His father was a medical practitioner and his mother a hospital ward sister. His maternal grandparents lived in an annexe, built on the side of the house by his maternal grandfather who was a stonemason and builder. Two rooms at the front of the family house were for his father's surgery. Bailey was educated at King Edward's School, an independent school in Bath where he was initially a highly academic pupil winning most of the prizes. At about the age of 15, he started to become distracted from school work when he realised the thrill of performance as a member of a school band called Behind Closed Doors, which played mostly original work. He was the only pupil at his school to study A-level music and he passed with an A grade. He also claims to have been good at sport (captain of KES 2nd XI cricket team 1982), which often surprised his teachers. He would often combine music and sport by leading the singing on the long coach trip back from away rugby fixtures. It was here that he was given his nickname Bill by his music teacher, Lynda Phipps, for being able to play the song "Won't You Come Home Bill Bailey" so well on the guitar. He started studies for an English degree at Westfield College of the University of London but left after a year. He is a classically trained musician and received an Associateship Diploma from the London College of Music as well as being made an honorary member of the Society of Crematorium Organists. He performed with a boy band "The Famous Five". Acting roles included a part in a Workers' Revolutionary Party stage production called The Printers, which also featured Vanessa Redgrave and Frances de la Tour. Until 24 February 2018, nobody was quite sure when Bill Bailey was born. There were two possible dates- 24 February 1964 or 13 January 1965- the latter being correct. Bailey is a supporter of the Labour Party and appeared in the Labour Party's fifth party election broadcast of the 2010 General Election campaign. However, he was critical of Labour during the 2015 election campaign, describing leader Ed Miliband as "a plastic bag caught in a tree", adding that "no one knows how he got up there and no one can be bothered to get him down". Bailey is an outspoken feminist and supporter of the Fawcett Society. Bailey is a prominent voice of men's issues, most notably prostate cancer and the Men United campaign. In 2015, Bailey endorsed Jeremy Corbyn's campaign in Labour Party leadership election. He said "Corbyn's nomination showed there is a kind of craving for a bit of honest speaking, a bit of principled plain speaking. But I think he is in a bit of a bind. Nuanced debate doesn't cut it in the toxic, political atmosphere. He’s having a fast-forward of his own political evolution, having to become 'a politician' – the thing he never was." Bailey is a patron of International Animal Rescue and has been instrumental in the organisation's campaign to rescue dancing bears. He has also campaigned for the Sumatran Orangutan Society. For his works in environmental conservation, he received an honorary doctorate in conservation and sustainability from the Australian University of the Sunshine Coast in October 2014. Bailey began touring the country with comedians such as Mark Lamarr. In 1984, he formed a double act, the Rubber Bishops, with Toby Longworth (a fellow former pupil at King Edward's, Bath). It was there that Bailey began developing his own style, mixing in musical parodies with deconstructions of or variations on traditional jokes ("How many amoebas does it take to change a lightbulb? One, no two! No four! No eight..."). According to comedy folklore, after a reviewer once criticised his act for its lack of jokes, Bailey returned the following night, at Queen Margaret College, Edinburgh, to perform a set composed entirely of punchlines. Longworth left to join the RSC in 1989 and was replaced by Martin Stubbs. Stubbs later quit to pursue a more serious career, and in 1994 Bailey performed Rock at the Edinburgh Festival Fringe with Sean Lock, a show about an ageing rockstar and his roadie, script-edited by comedy writer Jim Miller. It was later serialised for the Mark Radcliffe show on BBC Radio 1. The show's attendances were not impressive and on one occasion the only person in the audience was comedian Dominic Holland. Bailey almost gave up comedy to take up a telesales job. He went solo the next year with the one man show Bill Bailey's Cosmic Jam. The show led to a recording at the Bloomsbury Theatre in London which was broadcast in 1997 on Channel 4 as a one-hour special called Bill Bailey Live. It was not until 2005 that this was released on DVD uncut and under its original title. It marked the first time that Bailey had been able to tie together his music and post-modern gags with the whimsical rambling style he is now known for. After supporting Donna McPhail in 1995 and winning a Time Out award, he returned to Edinburgh in 1996 with a show that was nominated for the Perrier Comedy Award. Amongst the other nominees was future Black Books co-star Dylan Moran, who narrowly beat him in the closest vote in the award's history. Bailey won the Best Live Stand-Up award at the British Comedy Awards in 1999. Though he did not win the Perrier Comedy Awards in 1996, the nomination was enough to get him noticed, and in 1998 the BBC gave him his own television show, Is It Bill Bailey? This was not Bailey's first foray into television. His debut was on the children's TV show Motormouth in the late 1980s – playing piano for a mind-reading dog. Bailey reminisced about the experience on the BBC show Room 101 with Paul Merton in 2000. In 1991, he was appearing in stand-up shows such as The Happening, Packing Them In, The Stand Up Show and The Comedy Store. He also appeared as captain on two panel games, an ITV music quiz pilot called Pop Dogs, and the Channel 4 science fiction quiz show Space Cadets. Is it Bill Bailey? was the first time he had written and presented his own show. Over the next few years, Bailey made guest appearances on shows such as Have I Got News for You, World Cup Comedy, Room 101, Des O'Connor Tonight, Coast to Coast and three episodes of off-beat Channel 4 sitcom Spaced, in which he played comic-shop manager Bilbo Bagshot. In 1998, Dylan Moran approached him with the pilot script for Black Books, a Channel 4 sitcom about a cold-hearted bookshop owner, his nice-guy assistant, and their socially awkward female friend. It was commissioned in 2000, and Bailey took the part of the assistant Manny Bianco, with Moran playing the owner Bernard and Tamsin Greig the friend, Fran. Three series of six episodes each were made. When Sean Hughes left his long-term role as a team captain on Never Mind the Buzzcocks in 2002, Bailey became his successor. His style quickly blended into the show, possibly helped by his background in music. He soon developed a rapport with host Mark Lamarr, who continually teased him about his looks and his pre-occupation with woodland animals. It was announced on 18 September 2008 that Bailey would leave the series and be replaced by a series of guest captains including Jack Dee and Dermot O'Leary. While touring in 2009, Bailey joked that the main reason for leaving the show was a lack of desire to continue humming Britney Spears' Toxic to little known figures in the indie music scene. During this time he also left his position as "curator" of the Museum of Curiosity, and declared his intention to "retire" from panel games, although he has since appeared on QI many more times and hosted Have I Got News For You. Bailey has appeared frequently on the intellectual panel game QI since it began in 2003, alongside host Stephen Fry and regular panellist Alan Davies; he was also the winner of the show's unaired pilot episode. Other television appearances include a cameo role in Alan Davies' drama series Jonathan Creek as failing street magician Kenny Starkiss and obsessed guitar teacher in the "Holiday" episode of Sean Lock's Fifteen Storeys High. He later appeared with Lock again as a guest on his show TV Heaven, Telly Hell. He has also appeared twice on Friday Night with Jonathan Ross. Bailey also hosted his own show Comic's Choice, which aired in 2011. Bailey also presented Wild Thing I Love You which began on Channel 4 on 15 October 2006. The series concentrates on the protection of Britain's wild animals, and has included re-homing badgers, owls and water voles. Bailey appeared in the second series of the E4 teenage "dramedy" Skins playing Maxxie's dad, Walter Oliver. In episode 1, Walter struggles with his son's desire to be a dancer, instead wishing him to become a builder, which is what he himself does for a living. Walter is married to Jackie, played by Fiona Allen. Bailey appeared on the first episode of Grand Designs Live on 4 May 2008, helping Kevin McCloud build his eco-friendly home. In 2009, Bailey appeared in the BBC show Hustle as the character "Cyclops", a side-line character. In autumn 2009, Bailey presented Bill Bailey's Birdwatching Bonanza. To continue his foray into natural history, Bailey presented ITV1's half-hour wildlife mini-series Baboons With Bill Bailey. The series was filmed in Cape Town and spanned eight episodes, with exclusive content available on itvWILD. Bill Bailey played Droxil, a Harvest Ranger from the Planet Androzani Major, in the 2011 Christmas Special of Doctor Who, titled The Doctor, the Widow and the Wardrobe. In 2009, Bailey presented a project about the explorer and naturalist Alfred Russel Wallace, in the form of an Indonesian travelogue. Bailey said in an interview that Wallace had been "airbrushed out of history", and that he feels a "real affinity" with him. In 2013, to coincide with the centenary of Wallace's death, Bailey presented a two-part documentary, Bill Bailey's Jungle Hero, first broadcast on BBC Two on 21 and 28 April 2013. He travelled around producing and filming the series in Indonesia and Borneo. In 2001, Bailey began touring the globe with Bewilderness. A recording of a performance in Swansea was released on DVD the same year, and the show was broadcast on Channel 4 that Christmas. A modified version of it also proved successful in America, and in 2002 Bailey released a CD of a recording at the WestBeth Theatre in New York City. The show contained his popular music parodies (such as Unisex Chip Shop, a Billy Bragg tribute, which he also performed with Bragg himself at the 2005 Glastonbury Festival), "three men in a pub" jokes (including one in the style of Geoffrey Chaucer) and deconstructions of television themes such as Countdown and The Magic Roundabout. A Bewilderness CD was sold outside gigs, a mixture of studio recordings of songs and monologues Bailey had performed in the past – it was later released in shops as Bill Bailey: The Ultimate Collection... Ever! That same year he also presented a Channel 4 countdown, Top Ten Prog Rock. Bailey premiered his show Part Troll at the 2003 Edinburgh Festival Fringe. A critical and commercial success, he then transferred it to the West End, where tickets sold out in under 24 hours, and new dates had to be added. He continued to tour it all over the UK as well as in the US, Australia and New Zealand. Bailey expanded on subjects such as the war on Iraq. He also talks extensively about drugs, at one point asking the audience to name different ways of baking cannabis. A DVD was released in 2004. 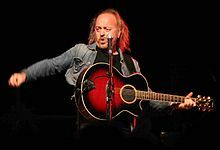 2005 saw the release of his 1995 show Bill Bailey's Cosmic Jam. The two-disc set also contained a director's cut of Bewilderness, which featured a routine on Stephen Hawking's A Brief History of Time not seen in the original version. Bailey performed a show at the 2006 Edinburgh Festival Fringe entitled Steampunk. Bailey appeared at the Beautiful Days festival in August 2007. The UK leg of the Tinselworm tour enjoyed three sell-out nights at the MEN Arena in Manchester, Europe's largest indoor arena, and culminated with a sell-out performance at Wembley Arena. Early in 2007, a petition was started to express fans' wishes to see him cast as a dwarf in The Hobbit films, after his stand-up routine mentioned auditioning for Gimli in The Lord of the Rings. The petition reached its goal in the early days of January, and was sent to the producers. It was hoped that as the Tinselworm tour took him to Wellington in New Zealand where the film was in pre-production, that he would be able to audition. Dandelion Mind was released on DVD on 22 November 2010. In 2012, his world tour was entitled Qualmpeddler, which toured England as well as returning to Australia and New Zealand in August and September 2012. In September and October 2018, Bailey toured his show, The Earl of Whimsy, to seven venues within New Zealand. "Perfect pitch ... occurs entirely at random in about one in every 10,000 of us, and I'm one of them. From as early as I can remember, I was able to pick out the pitch of things, not just instruments but washing machines, vacuum cleaners, dentists' drills." His stand-up routines often feature music from genres such as jazz, rock (most notably prog rock from the early seventies), drum'n'bass, classical, and even theme songs, usually for comic value. Favourite instruments include the keyboard, guitar, theremin, kazoo and bongos. He also mentioned in an interview that he has achieved Grade 6 Clarinet. He was part of punk band Beergut 100, which he founded in 1995 with comedy writer Jim Miller and also featured Martin Trenaman and Phil Whelans, with Kevin Eldon as lead singer. The band performed at the 2006 Edinburgh Festival Fringe. Trenaman and Welans had previously appeared in Cosmic Jam under the name "The Stan Ellis Experiment", and Trenaman and Eldon later featured with John Moloney in the Kraftwerk homage "Das Hokey Kokey" on the Part Troll tour. Bailey claims that he and the three other performers are a Kraftwerk tribute band called Augenblick. To mark the final gig of the Part Troll tour on 1 January 2005, the band reappeared on stage after the "Das Hokey Kokey" joke to play an hour-long encore of music. In February 2007, Bailey appeared twice with the BBC Concert Orchestra and Anne Dudley in a show entitled Cosmic Shindig. Performed in the Colosseum in Watford on 24 February and in the Queen Elizabeth Hall on 26 February, the show contained orchestrally accompanied versions of many of Bailey's previously performed songs, an exploration of the instruments of the orchestra and a number of new pieces of music. The Queen Elizabeth Hall performance was broadcast on BBC Radio 3 on 16 March 2007 as a part of Comic Relief 2007. Bailey had planned to put himself forward as Britain's Eurovision entry in 2008, as a result of several fan petitions encouraging him to do so. 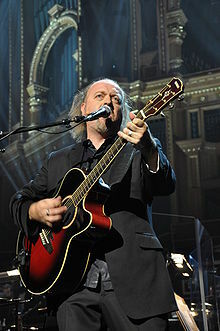 In October 2008, he performed Bill Bailey's Remarkable Guide to the Orchestra at the Royal Albert Hall with the BBC Concert Orchestra, conducted by Anne Dudley. In November 2009 he was a guest on Private Passions, the biographical music discussion programme on BBC Radio 3. Bailey supports Queens Park Rangers and describes himself an avid fan of Star Trek. He lives in Hammersmith with his wife Kristin, whom he married in 1998, and their son Dax, born in 2003. He also has a plant named after him, Nepenthes x Bill Bailey. The Libertine (Small cameo role as advisor to Charles II of England). ^ a b Philby, Charlotte (5 December 2009). "Stand up guy: Bill Bailey on music, marriage and the moment he refused to sell out". The Independent. London. Retrieved 13 August 2010. ^ "Bill Bailey". Front Row. 8 November 2010. BBC Radio 4. Retrieved 18 January 2014. ^ "The 50 funniest people in Britain (part one)". The Guardian. 7 December 2003. ^ "The 100 Greatest Stand-Ups – Announcements – Greatest Stand-Ups of All Time!". Channel 4. 11 April 2010. Retrieved 26 August 2011. ^ Greenstreet, Rosanna (29 October 2016). "Bill Bailey: 'The worst thing anyone's said to me? "You're that bloke off the Hairy Bikers"'". the Guardian. Retrieved 4 June 2018. ^ a b "Desert Island Discs featuring Bill Bailey". Desert Island Discs. 8 June 2008. BBC. Radio 4. ^ "Comedy Map of Britain". News Events & Diary. King Edward's School, Bath. 2007. Archived from the original on 29 September 2007. Retrieved 2 February 2007. ^ "People are obsessed by how I look", The Independent, 21 November 2008. ^ "The Society of Crematorium Organists". The Society of Crematorium Organists. Retrieved 20 October 2018. ^ Vanilla Storm Limited. "Biography". billbailey.co.uk. Archived from the original on 8 December 2015. Retrieved 2 December 2015. ^ Bailey, Bill (24 February 2018). "Thanks for all the lovely birthday messages. I accept them as belated wishes for my actual birthday which is in January, the 13th and it was in'65 so papers all wrong . Fake news! SAD! Anyway here's me celebratin'pic.twitter.com/QEyF4wlpjK". @BillBailey. Retrieved 17 March 2018. ^ "Bill Bailey: it's no time for a mid-life crisis". Stuff. Retrieved 17 March 2018. ^ "Sixty Seconds". YouTube. 3 May 2010. Retrieved 26 August 2011. ^ "Jacking it in – the Labour luvvies leaving Ed – Sun Nation". Sun Nation. Retrieved 2 December 2015. ^ "Bill Bailey". Fawcett Society. Archived from the original on 28 September 2011. Retrieved 22 August 2011. ^ Moore, Suzanne (26 February 2011). "What's the nicest thing a man can do for a woman? Shout at a bigot". The Guardian. Retrieved 22 August 2011. ^ "Prostate Cancer UK". prostatecanceruk.org. Retrieved 2 December 2015. ^ Ellis, David (10 December 2015). "Bill Bailey on happiness, Jeremy Corbyn and how turning 50 changed him". London Evening Standard. Retrieved 1 May 2018. ^ "Dancing bears 'tradition' to be halted in India". Wildlife Extra. October 2006. Retrieved 12 December 2011. ^ "Comic joins animal protest". The Argus. 3 May 2008. Retrieved 12 December 2011. ^ "Bill Bailey — Honorary Doctorate ceremony at University of the Sunshine Coast". University of the Sunshine Coast. Archived from the original on 14 October 2014. Retrieved 14 October 2014. ^ "Bill Bailey: For whom the Bill toils". The Independent. London. 18 November 2004. ^ "Bailey says goodbye to Buzzcocks". BBC News. 18 September 2008. Retrieved 18 July 2012. ^ "Bill Bailey's Birdwatching Bonanza". Internet Movie database. Retrieved 7 October 2012. ^ "Something hairy's on the telly tonight! Also features baboons". Bill Bailey. 8 April 2011. Archived from the original on 1 October 2011. Retrieved 26 August 2011. ^ "ITV – Baboons with Bill Bailey". itvWILD. Retrieved 26 August 2011. ^ "Comedian Bill Bailey's new show about Alfred Russel Wallace". The Alfred Russel Wallace Website. Retrieved 9 November 2010. ^ "Bill Bailey's Jungle Hero". BBC. 7 June 2013. Retrieved 26 May 2014. ^ "ABC Triple J interview with Bill Bailey". Abc.net.au. 9 June 2012. ^ "All That Glitters". Wired, Croydon's listings magazine. Archived from the original on 4 January 2008. Retrieved 31 December 2007. ^ Bailey, Bill (15 October 2004). "Weird science". The Guardian. London. Archived from the original on 30 March 2010. Retrieved 13 April 2010. ^ Simon Neville (2006). "Looking back at a week of Fringe madness". The Scotsman. UK. Retrieved 2 January 2007. ^ Natbat (2006). "Kevin Eldon Interview". notbbc.co.uk. Retrieved 2 January 2007. ^ "The essential guide to Edinburgh". The Guardian. London. 28 July 2006. Retrieved 2 January 2007. ^ "Eurovision". Bill Bailey. Archived from the original on 26 October 2011. Retrieved 8 October 2011. ^ Logan, Brian (17 October 2008). "Bill Bailey's Remarkable Guide to the Orchestra". The Guardian. London. Archived from the original on 18 October 2008. Retrieved 20 October 2008. ^ 2 days left. "BBC Radio 3". BBC. Retrieved 26 August 2011. ^ Bhamra, Satvir. "Bill Bailey to headline Sonisphere". Amplified.tv. Archived from the original on 2 March 2012. Retrieved 26 August 2011. ^ "Bill Bailey – Celebrity fans – Interviews". FourFourTwo. 31 July 2009. Archived from the original on 18 July 2011. Retrieved 26 August 2011. ^ "denofgeek.com Bill Bailey Interview". ^ "Borneo Exotics strikes gold for the third time at Chelsea Flower Show". sundaytimes.lk. Retrieved 2 December 2015. ^ Oderberg, Isabelle (22 June 2012). "Bill Bailey's back with no qualms". Herald Sun. Retrieved 26 June 2012. ^ Hitsuzen (29 April 2005). "The Hitchhiker's Guide to the Galaxy (2005)". IMDb. Retrieved 2 December 2015. ^ shead23 (14 October 2011). "Chalet Girl (2011)". IMDb. Retrieved 2 December 2015. ^ Christmas Guest Stars Revealed. Doctor Who News. Retrieved 20 April 2012. Bill Bailey at the BFI's Screenonline.